For Mills brand metal partitions. Chrome plated zamak. For metal partitions. Edge mounted. Replacement for Mills / Bradley. Chrome plated zamak. For 1 1/4" thick Mills metal or stainless partitions. 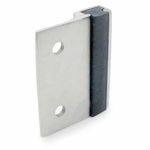 Used with round concealed latch slide pin. 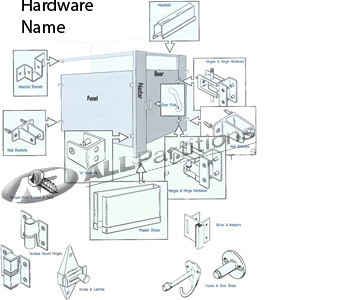 Bottom door cap for Mills brand metal partitions. 3/8" offset bar to door clearance. Fits on surface of wall or edge of pilaster. 3 3/8" projection, 2 3/4" high. Latch only. Use with keeper A147413 and strike A5173. Can also be used with keeper bumpers HAP54, HAP55, HAP56, HAP57, HAP58, and HAP59. Keeper only. For use with A6983 latch ONLY. This item has been discontinued by Mills and is no longer available. Use A6983, A147413, and A5173.